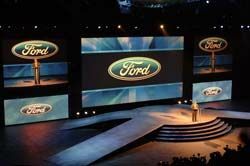 Ford utilized MiTRIX LED panels for their press events, along with wide screen HD projection. For the center screen, a massive 22.5' X 40' rear projection Stewart, was fed by a Vista Spyder hi-resolution system (HD at 1920X1080) and supported by Barco XLM25 HD projectors.Its been close to a decade since Creative Technology was first called upon to provide innovative solutions for many of the worlds largest automotive manufacturers exhibiting at the North American International Auto Show in Detroit. And, while each year the stakes are higher and the technology grows more complex, the logistics involved are, for this impressive team, all in a days work. Creative Technology, although headquartered in Los Angeles, is one of this country's most formidable national and international staging companies. In fact, CT Germany also participated in staging the Detroit Auto Show. Creative Technology is one of just a few U.S. companies that can stage so many top booths at the Detroit Auto Show. Its relatively straightforward, said Herb Brandt, general manager of Creative Technology Las Vegas. We come in at the beginning of the project, at pre-production and design, where we can see the clients vision and well provide them with the best possible solutions. Over the next several months, were in constant communication with all the individuals involved in the project; discussing design changes, budget revisions, crew needs, etc. Were an integral part of their team. Many of the same people have worked together for such long time that its almost as if we can read each others minds. When the show floor opens and the attendees arrive, what weve done wows a lot of people, but were just doing our jobs. This year, Creative Technology was present at Detroits Cobo Center on behalf of Ford Motor Company, General Motors, Daimler Chrysler, Toyota Lexus, Mazda, Jaguar, Mitsubishi, Subaru, Saab, Audi and XM Radio. Jeff Meyer, general manager of Creative Technology Chicago, oversaw the audiovisual systems for the press events held by General Motors, Daimler Chrysler, Toyota Lexus, as well as an exclusive event hosted by GM, entitled GM Style. Held at the Renaissance Center, GM Style celebrated automotive design by putting cars, fashion and entertainment together on the catwalk. Some of the hottest names in the entertainment industry were on hand to introduce over a dozen GMC Concept vehicles including the World introduction of the Jay Z Blue Yukon Denali and the 2007 Concept Camaro Convertible. Typically, Meyer stated, the major manufacturers will hold three press events: one for a new launch, another introducing a concept car, and a third dedicated to a specific special development, such as a hybrid automobile. For the General Motors events, Creative Technology utilized MiTRIX, a new LED display product from Barco. MiTRIX was chosen because it has the advantage of being small (384x192mm per panel), lightweight, semi-transparent, durable and requires no special rental structured for installation. CT mounted 1,416 MiTRIX panels onto two sides of an opening cylindrical turret. When closed, video was displayed on the convex side of the turret, and when opened, the images appeared on the concave side. We had three main sources and were using an Encore system to feed images to MiTRIX Wall 1, MiTRIX Wall 2 and a 45 panel Barco iLite 6mm LED screen. We pixel-mapped the MiTRIX, because each of the walls had a slightly different-sized pixel map, Meyer explained. Additionally, there were other feeds to numerous screens throughout the GM space and video was fed out for satellite broadcast. Meyer acknowledged that the main challenge associated with running press events is that set-up and teardown is happening while the main event, the actual trade show, is also taking place. When were working on the show floor installing a temporary event, in the middle of a permanent event, there are a lot of intricacies in interfacing, he said. You have to work in harmony with whatever else is going on in the space around you and be sensitive to the other professionals that are trying to fulfill their own objectives. Barco's new MiTRIX was chosen by Creative Technology as the centerpiece of the General Motor's booth at the 2007 North American International Auto Show. On a raised stage that served as the booth's focal point, a circular wall of MiTRIX modules, over 15 feet in height, was used to display graphics, video content and corporate logos during the company's opening press conference. The MiTRIX wall rotated to reveal GM's new E-Flex concept car within, also revealing the MiTRIX modules adorned both the inside and outside fascia of the structure. Creative Technologys Los Angeles team was responsible for providing the audiovisual systems for Ford Motor Companys press events. Gary Clark, account executive at Creative Technology Los Angeles, explained that Ford also utilized MiTRIX LED panels for their press events, along with wide screen HD projection.We used two MiTRIX 9 x 20 foot LED screens, positioned stage left and right, and placed them on roller tracks, which opened for car reveals. To enhance the creativity and flexibility of MiTRIX, we took advantage of its transparency and projected video imagery onto 9 x 30 foot Dalite cut sheets which were positioned 12 feet behind the MiTRIX screens, creating a 3-dimentional effect. The center screen, a massive 22.5 X 40 foot rear projection Stewart, was fed by a Vista Spyder hi-resolution system (HD at 1920X1080) and supported by Barco XLM25 HD projectors. Two 15 X 20 foot Stewarts flanked the main screen and were also fed from Spyder at their projectors' native resolution of 1400 X 1050. For image magnification, six cameras were cut by CTs custom-designed GVG Kayak HD 300 System. The entire system was being fed (DVI) digital, which resulted in incredible picture clarity on all three screens. When you have the leaders of Ford Motor Company together with a live satellite feed of Bill Gates on screen, introducing their joint venture, timing is crucial, said Clark. Thanks to a great crew, a lot of planning and attention to detail, everything was perfect. Brandt was involved with several booths at NAIAS including Ford, Jaguar, Lincoln, Mercury, Porsche, LandRover, Mitsubishi, Subaru, XM Radio and Mazda as well as Mazdas press event. The Ford booth was a massive undertaking with over 1,400 tiles of 6mm and 10mm LED. The Jaguar booth featured a custom structure made up of four towers of Hibino Chromatek 6mm LEDs placed on a circular motorized track. Each of the towers contained 72 tiles and, in conjunction with the media programming, separated, moved partially around the circle and then rejoined together as one screen. The Lincoln and Mercury booths both featured 209 tiles of Barco iLite 6mm XP LEDs, which moved along a motorized track between the two exhibits, serving as a mobile video display background. Again, the tiles were separated and brought together, on queue, in conjunction with the media that was playing at the time. Brandt admits that the preparation and execution of this type of massive undertaking requires know-how. It truly comes down to knowing what youre doing and being experienced with shows of this size and scope, he said. Experience teaches you to ask the right questions, to know what to look for and, especially, what to prepare for. Its here that the art of prediction comes into play, and most of the time, the devil is in the details. The big stuff is obvious, Brandt said. Its the big stuff that worries everyone, but youve got to know how to get down to the nitty-gritty and try to predict where something might go wrong. Everyone is busy and time is scarce, but you make the time to pay attention to the little things. Inevitably, things pop up and there will be surprises. But the further ahead that youve dealt with every little thing that you can possibly think of, the easier it is to handle the challenges that are unforeseen. For more information visit www.ctinternational.com. Not only does Creative Technology see to it that automobile manufacturers have the latest and greatest display technology to show off their wares in Detroit, but in other major cities across the country as well. Los Angeles kicked off the season, the beginning of December, with the LA Auto Show. Creative Technology Los Angeles partnered with CT offices in Las Vegas, Chicago and Germany to provide Jaguar, Porsche, Mitsubishi, LandRover, Volvo and Volkswagen with high performance AV. Kraig Aaronson, project manager at Creative Technology Los Angeles, admits that while many of the booths and press events are similar to the Detroit event, the L.A. show is smaller in scale and requires less equipment and technical staff. This doesnt mean, however, that the event requires any less pre-planning, communication or attention to detail. Logistically it has its own set of challenges. Because it is not as large, the timeframe for set-up and teardown is more condensed and often, certain elements from an exhibit will be sent to the next city on the circuit while the rest of the exhibit is heading to another location. Like the Detroit show, you have to be on top of your game and be ready for anything, said Aaronson. The Mazda Booth at the Cobo Conf & Exhibition Center featured 258 tiles of Barco iLite 6mm XP LED, and Watchout show control. Equipment Highlighted: Switching systems, cameras and audio, no display devices. Equipment Highlighted: 258 tiles Barco iLite 6mm XP, Watchout show control, audio. Equipment Highlighted: Two Screens each containing 192 tiles of Barco MiTRIX LED - stage right and left, Kayak HD300 flypack, cameras, Vista Spyder, Center Video Projection = Barco XLM HD Projectors onto 22.4x40 rear screen, Left & Right projection = Barco R12 DLP Projectors onto 15x20 Stewart Screens, upstage reveal projection = Sanyo XF35 LCD projectors onto 9'x33' Dalite RP fabric. Equipment Highlighted: 180 tiles Barco oLite 10mm Indoor/outdoor LED, 2 Barco LED HD-SDI Input Modules, 2 SDI input modules, 1 Doremi V1UHD Hard Drive. Equipment Highlighted: 1275 tiles Barco iLite 6mm XP LED , 23 Barco D320 PL Digitizers, 23 Barco LED HD-SDI Input Modules, 10 SDI input modules, 10 Doremi V1UHD Hard Drives. Equipment Highlighted: 209 tiles Barco iLite 6mm XP LED, 3 Barco D320 PL Digitizers, 3 Barco LED HD-SDI Input Modules, audio. Equipment Highlighted: 45 tiles Barco iLite 6mm XP LED, audio. Equipment Highlighted: 35 tiles Barco iLite 6mm XP LED, audio, 1 Pioneer PDP V402 Plasma display. Equipment Highlighted: 18 Panasonic 50" plasma displays, audio.